The power of Windows 10 is undisputable, but it seems to consume much power while working. Under the Windows category of Reddit, a user said that he got less battery backup in windows 10 than Windows 8.1 "I was getting about 4 hr of battery backup, and now around 2 hr". If you have the similar questions, this article compiling the most helpful battery saving tips for Windows 10 laptops/handsets can help you get out of this trouble. It is necessary to know how to extend the battery life in case that there's no way to get your Windows 10 devices charged. WinX DVD Ripper Platinum – Rip DVD as a digital copy which can be directly played from Windows 10 device hard drive with less power consumption, because you don't need to watch DVD movie with optical drive. WinX HD Video Converter Deluxe – It is able to save battery of Windows 10 laptops/tablets/phones by free downloading movies videos for offline playback and converting/compressing HD/4K/8K UHD video. Many new features are added in Windows 10, including Battery Saver. It is a useful option to limit background activity and dynamically tweak hardware settings to save battery. You can turn it on automatically using rules (for example, enable it when the battery gets below 30%). Alternatively, you can turn it on manually with the "Right now" switch. Any USB peripheral connected to your Windows 10 notebook can drain your battery life. If you don't need them, just unplug them. Besides, DVDs, CDs and Blu-rays can also consume your battery. To increase Windows 10 laptop battery life, you should remove all of them. But if you really want to watch DVD movies on Windows 10 laptop, you're suggested to get a digital copy onto your hard drive instead. Playing a digital movie from the hard disk requires less power than watching DVD from the optical drive. You just need a DVD ripper for Windows 10 to get a digital copy from your DVD disc with ease. WinX DVD Ripper Platinum, the popular DVD ripper for Windows 10, is available to rip both homemade and commercial DVDs encrypted by DVD CSS, region code, RCE, Sony ArccOS, UOPs, Disney X-project DRM, etc., such as Inside Out and Zootopia to common video formats (MP4, AVI, WMV, MOV, etc.) and popular devices (Windows 10 phones/tablets/laptops, Surface Pro, Xbox, iPhone, iPad, Sony Xperia Z3, Google Nexus 7, etc.). After ripping DVD as a digital file, you can play DVD movies directly from your hard disk with less battery consumption on Windows 10 laptop. Step 1. Download, install and launch this DVD ripper on your Windows 10 PC. Then load DVD disc by clicking "DVD Disc". Step 3. Set a destination folder to store the digital copy. Step 4. Hit RUN to begin ripping DVD movies as a digital file. After a while, you can get a digital copy of the DVD and play it on Windows 10 laptop to save battery. The display screen can use a ton of power. To saving battery on Windows 10 laptop, you should dim the brightness down. This method can also be used to extend the battery life of Windows 10 tablets and phones. As we have mentioned above that display can consume much battery. Besides lower the display brightness, you can set a time to turn off the display or make it into a dim: open Control Panel -> choose Power Options -> click on Choose when to turn off the display link -> then, you will come to Edit Plan Settings where you can set the time to turn off the display and put the computer to sleep for two situations (On battery and Plugged in). One of the most effective battery saving tips for Windows 10 laptops is selecting the Power Saver option as your power plan. You can easily enable it with several steps: go to Control Panel -> click on Hardware and Sound -> click on Power Options -> choose Power saver. 1. Disable Bluetooth: PC and Devices -> Bluetooth -> turn off the Bluetooth mode. 2. Turn on Airplane Mode to disable all the mobile data connection including Wi-Fi: Start Menu -> PC Settings -> Network -> Airplane Mode -> turn Airplane Mode on. 3. Turn off automatic tasks and exit/uninstall unnecessary programs on Windows 10 to reduce CPU usage. This is because more programs might make CPU work more which leads to the consumption of more power. 4. Deactivate the screen saver. 5. Protect the battery itself. If the battery contacts get dirty or damaged, it can reduce and disrupt the flow of power. 6. Do regular hard disk defragging to make data retrieval more efficient. It can reduce the time required to access data and save the battery of Windows 10 laptops. 7. Upgrade to a solid-state drive (SSD) and add more RAM to system to improve Windows 10 laptop battery life. 9. Turn off backlit keyboards. 10. Close messaging software and apps that ping the Internet in the background. In the previous section, we mainly focus on the battery saving tips for Windows 10 laptops, but here, we'd like to show you a useful software program which can extend the battery life of Windows 10 laptops as well as Windows 10 smartphones and tablets, namely, WinX HD Video Converter Deluxe. 1. It extends the battery life of Windows 10 devices by free downloading videos from YouTube, Dailymotion and other 300+ online video sites for offline playback instead of watching online videos. Playing online videos requires the Wi-Fi/3G to connect internet, GPRS to receive video image, consistent decoding and converting, etc, which can drain a great deal of power. 2. It extends the battery life of Windows 10 facilities, say, Surface Hub, by converting/compressing 1080p HD/4K/8K UHD videos. Playing HD videos will put heavy pressure on CPU and RAM. The more CPU and RAM work, the more power consumed. So, if you want to save the battery of Windows 10 laptops/mobiles, you can use this video converter to compress videos. 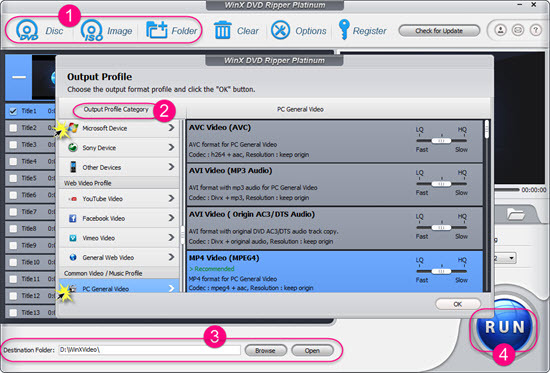 WinX HD Video Converter Deluxe can easily free download online videos and compress HD videos to Windows 10 phones/pads/laptops to save battery. Output profiles for Windows 10 laptops/tablets/phones are coming soon.